Okay so this time I decided to give the Food Network Chefs Cooking Challenge a go! 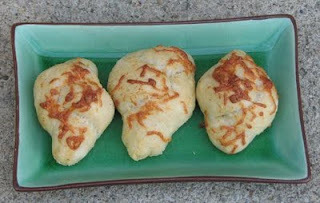 This is hosted by http://iblamemom.blogspot.com/ so go over to check out some other great recipes! This week's chef is Alexandra Guarnaschelli. I admit that before this I had no idea who she was, she is not on any of the shows I watch lol. But I perused her list of recipes on foodtv.com and decided to give it a go. 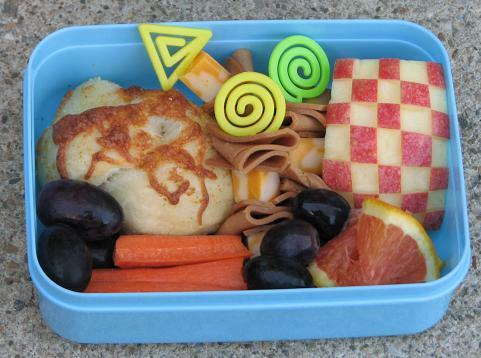 Kidlet got a Garlic Knot, soy ham and cheese chunks on skewers, checkered apple, orange, grapes, and carrots. He said the Knot was delicious and asked for another one for his snack! Place about 1/2 cup of olive oil into a bowl. Grate the garlic right over the oil. Break off pieces of leftover pizza dough and roll into little logs. Next, fold into a knot. Place the knots into the olive oil mixture and place onto the baking sheet. Season with salt, to taste, and place in the oven. Bake until the garlic knots are golden brown, about 8 to 10 minutes. So, I realize how ridiculously easy this was. I did add a little grated cheese to the top as well, they were delicious! I did not make her pizza dough however as I already had some in my fridge so I used that up. Overall it was fun and delicious! Yum! The lunch looks awesome. How do you get the squares on the apple so perfect?? Any kids would gobble that right up. yum -- I looked at these too, so glad they were tasty. Thanks! I completely missed this recipe, it looks like a good one! What a super cute lunch!! And those garlic knots sound delicious! That is ridiculously easy and sounds yummy. I love garlic these look so yummy. I love your boxes. So creative!